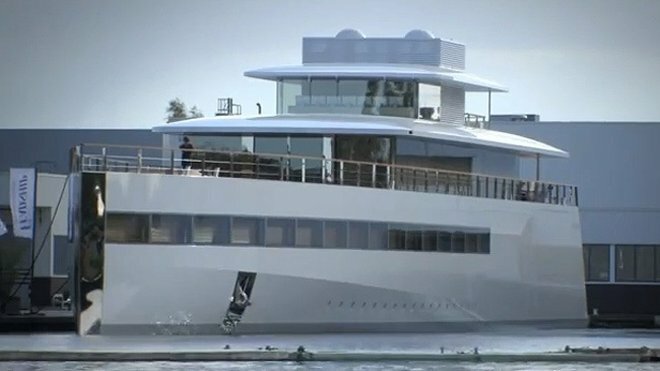 Steve Jobs’ custom-built 260-foot yacht was finally completed by a Dutch shipbuilder this month – one year after his death. The sleek ship is made of light-weight aluminum and Steve Jobs employed the chief engineer of his Apple stores to help design special glass that allowed the ship to be installed with ten-foot-high windows across the hull. The yacht is christened Venus, after the Roman goddess of love. The cost of the superyacht is unknown, though Steve Jobs was obsessed with completing it near the end of his life. “I know that it’s possible I will die and leave Laurene with a half-built boat,” he told biographer Walter Isaacson. Sadly, Steve Jobs, who died in October 2011 of complications from pancreatic cancer, never saw his creation finished. The Dutch technology blog One More Thing reports that the Jobs family will be on hand for the formal unveiling of the yacht at the Feadship custom yacht building company in Aalsmeer, Netherlands. Steve Jobs’ family gave out custom iPod Shuffle mp3 players to each of the crew members who helped build the yacht. Each one came with a note thanking them for their “hard work and craftsmanship”. Among the high-tech features inside the ship are seven 27-inch iMac computers. Steve Jobs employed renowned designer Philippe Starck to lay out in the interior. It is unknown when the breathtaking ship will make its maiden voyage.